We have been eating Nasi Goreng for years after sampling a sort of hybrid version in China Town, Vancouver. This very tasty and popular Indonesian fried rice dish can be made with a variety of proteins and as with almost every traditional delicacy, there are many versions of Nasi Goreng. Some are more complicated than others, calling for a trip to an Asian specialty store. Our version is simple and super-fast to make plus you won’t need to go hunting high and low for unusual ingredients, most can be found in your regular local grocery store. 2oz diced mixed vegetables – corn, peas, carrot. 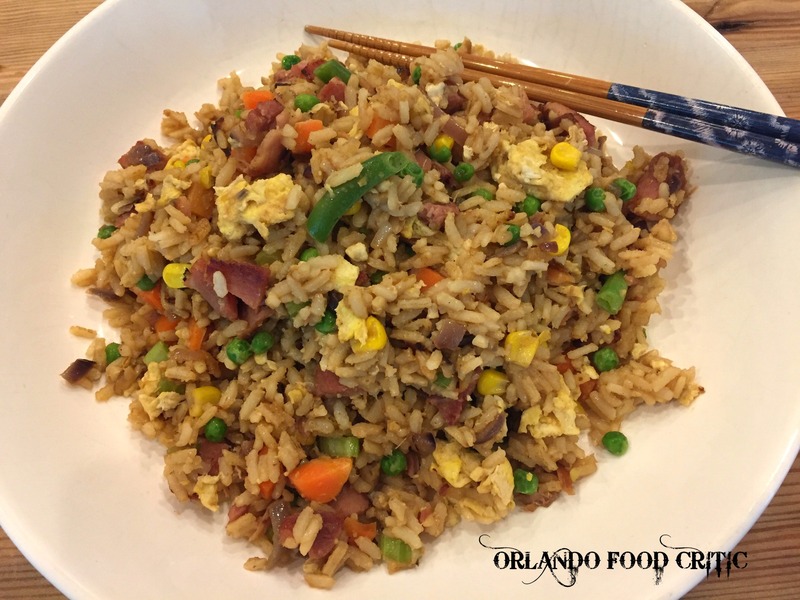 The most important step in preparing this dish is to ensure your rice is cooked and cold, perfect fried rice is virtually impossible to achieve when you try to fry straight after cooking. Crack two eggs into a bowl and whisk lightly, then pour into a skillet on medium heat and stir. You are looking for the consistency between an omelet and scrambled eggs. Once cooked break up the egg and put to one side. In the same skillet sauté the onion until translucent in a small amount of olive oil, then add the shrimp, chicken, garlic, sesame oil, sambal oelek, mirin and mixed vegetables. Cook for a few minutes until the mirin has been absorbed. Then remove from the pan and set aside. Again, in the same skillet fry the cooked rice for about a minute, then add the hoi sin sauce and mix well. When fully incorporated add the egg and all the other ingredients you previously set aside, stir constantly so the rice mixture does not stick. Taste and adjust the seasoning with soy sauce. When fully heated through, plate and serve. This dish is traditionally served with a fried egg on top but we prefer ours incorporated into the dish. There are also many ways to dress the dish, from fried onions to chopped scallions, the choice is yours.